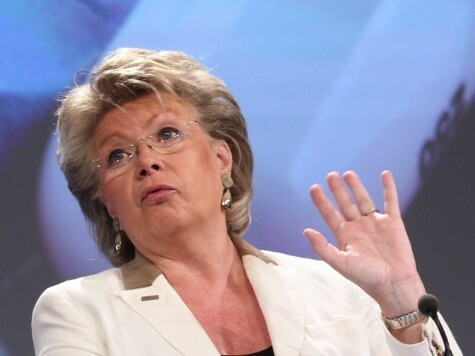 In yet another disturbing attack on democracy and self-determination, Vice President of the European Commission Viviane Reding claimed that Britons are too ignorant to vote on membership in the European Union (EU). Reding–a career union leader and bureaucrat–lashed out multiple times against the British public last night during an EU-sponsored “Citizen’s Dialogue” event in London. She claimed that migrants work harder than Britons and implied that UK voters “simply cannot” make an “informed decision” over the future of the UK’s role in the European Union. For some reason, Reding thought it would be a good idea to boast about the fact that 70 percent of Britain’s laws are now “co-decided” by the European Parliament. As a native of Luxembourg, it is understandable that Reding may not have much in the way of patriotism or national identity. To come to Britain and brag about how the EU is whittling away our national sovereignty is a sure-fire way to lose the debate. The European Union hosts these propaganda exercises called the “Citizen’s Dialogues” between three and five times a month. The travelling circuses, which cost European Union taxpayers a fair amount of money, are effectively aimed at placating a skeptical public. I personally got to attend one when I was in Riga in Latvia last October. It was truly bizarre. There was fancy food upon entry, free EU tote bags, expensive “voting” machines in the room, and a huge audio visual presentation alongside a panel discussion aimed at convincing people that the EU wasn’t just a bunch of faceless, left-wing bureaucrats. Suffice to say they failed to swing my vote. It strikes me as both twisted and offensive that Reding should come to London to tell us how we’re all idiots, and that she, as a life-long trade union member and bureaucrat, knows what is best for us. This is the person who claims to know what’s best for us.